Foods we enjoy as adults depends greatly on what we ate growing up. When my husband and I got married he did not eat many vegetables. This was due to the fact his mother always cooked them until they were mushy. Cauliflower is one of the vegetables he refused to eat. One day several years ago we had a disagreement about different taste in foods. He agreed to eat whatever I fixed that night for dinner. I made Pasta Primavera. He now will eat cauliflower in this dish and even requests that I make it. This recipe is quick and easy to make. In the time it takes to cook spaghetti noodles, dinner is ready. Begin by boiling water to cook pasta, per the instructions on the package. Meanwhile, in a large saucepan, combine first 5 ingredients. Bring to a simmer. Reduce heat and cover. Cook 8 minutes, stirring occasionally. Add chicken and heat through. Add salt and pepper to taste. Serve over cooked spaghetti noodles. Notes: California style mixed vegetables consists of broccoli, cauliflower and carrots. 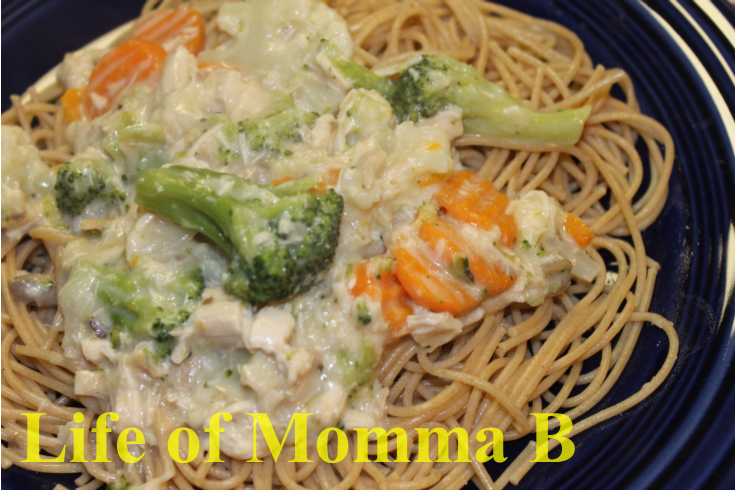 This entry was posted in Recipes and tagged broccoli, carrots, cauliflower, chicken, dinner, main course, one pot meal, pasta. Bookmark the permalink.